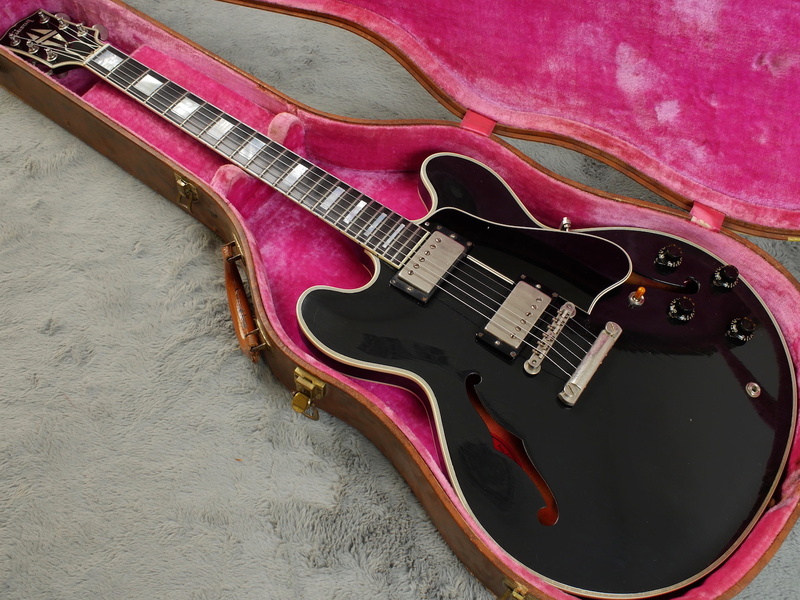 Less than 20 of these first year 1959 ES-355’s were made in factory mono, factory stop tail but no Vairtone - this is one of them. 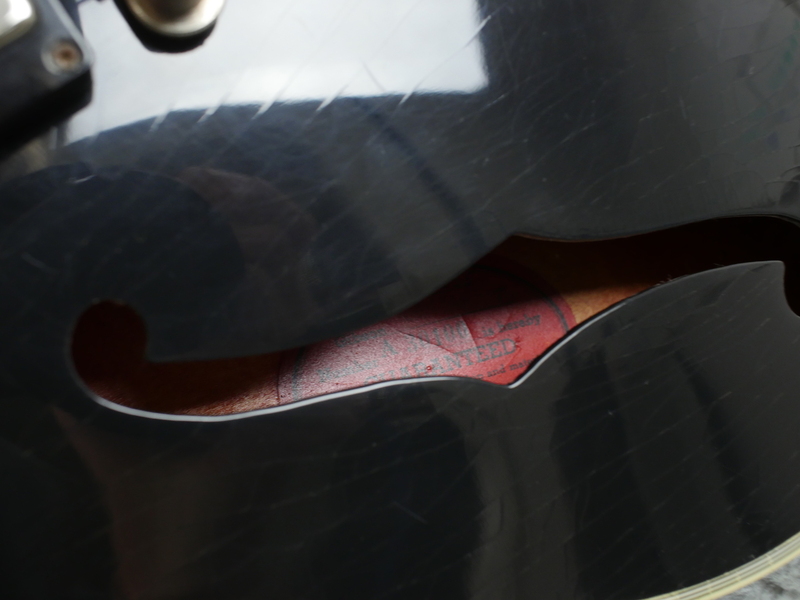 We bought it as a husk with the intention of restoring it to its former glory as close as we possibly could. 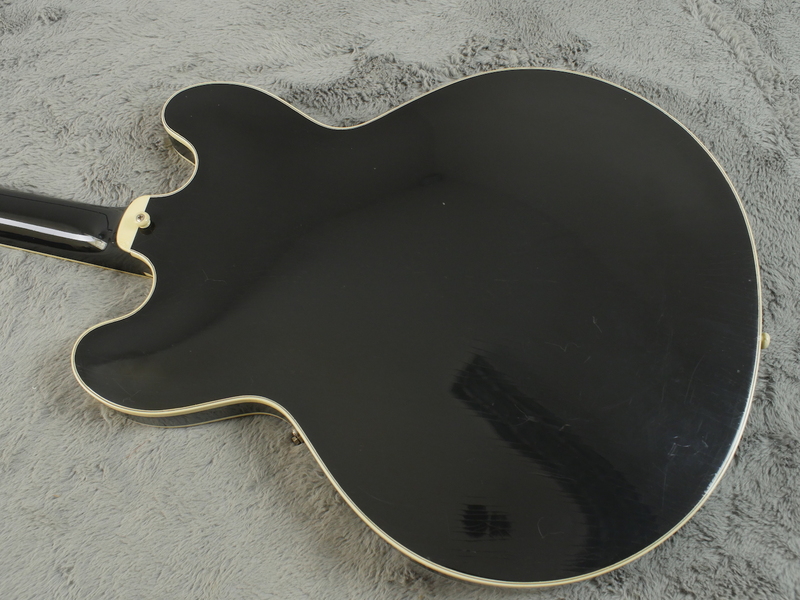 It was originally cherry red of course, then at some stage was sprayed sunburst then a little while ago was sent to Historic Makeovers who refinished it in black and aged it to perfection. 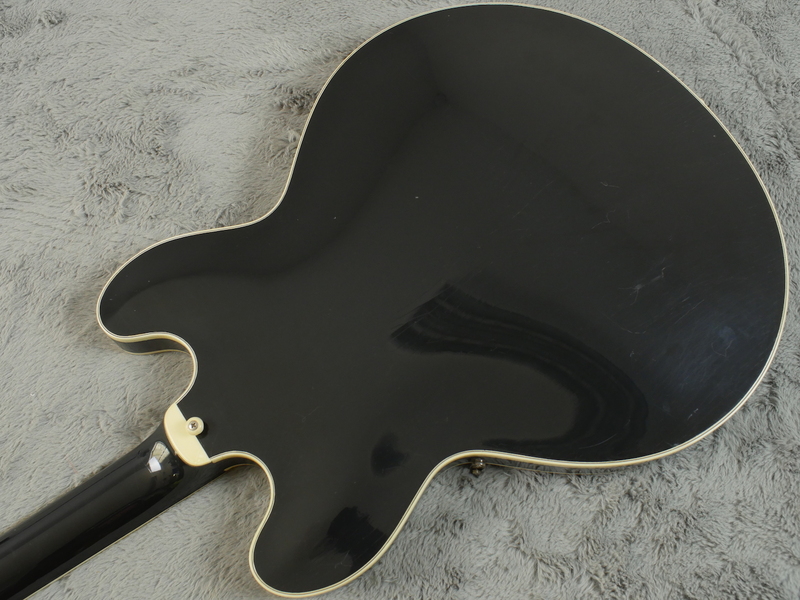 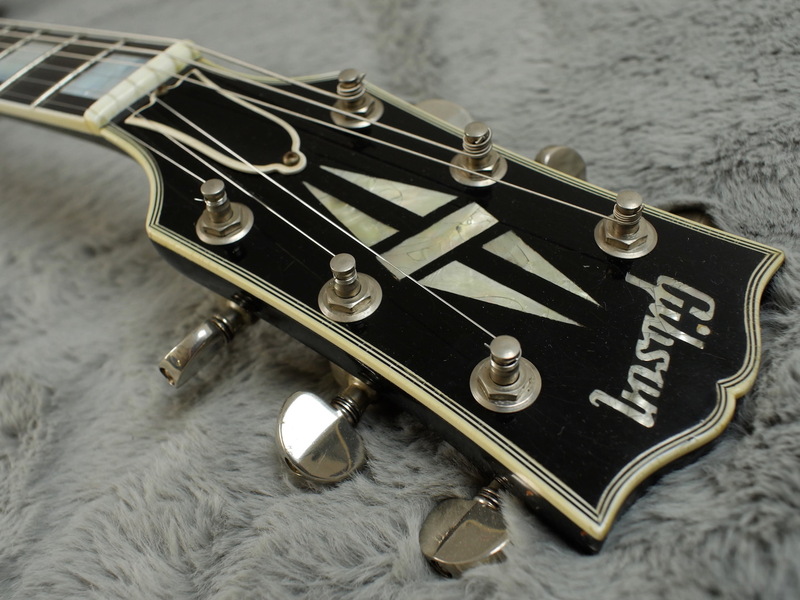 We have pictures of when this guitar was last stripped which prove there was never any kind of Bigsby or any other type of tailpiece fitted other than the factory stop tail. 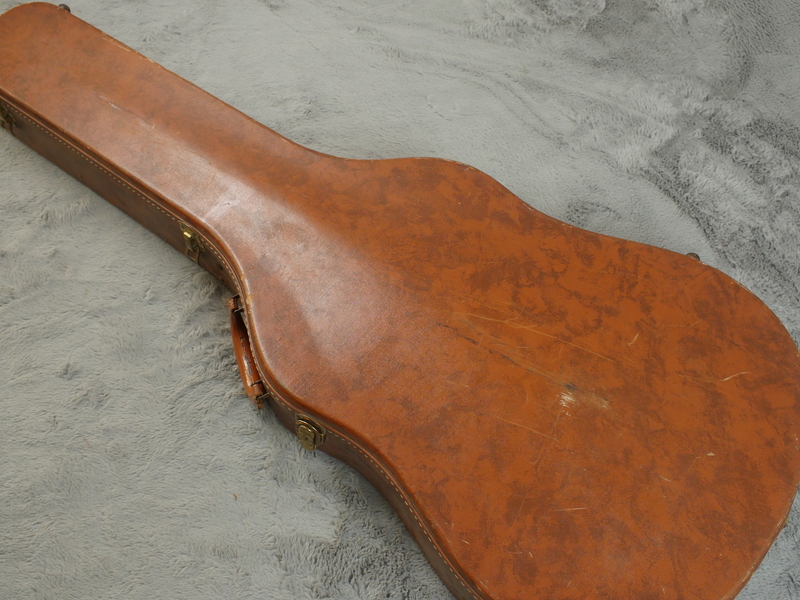 The pictures also show that it was never equipped with a Varitone either. 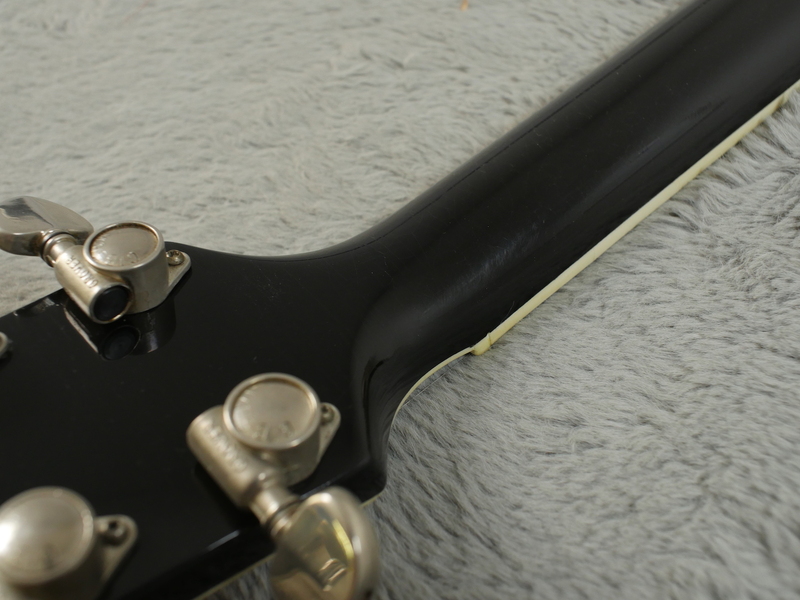 When it was stripped, you can make out a very small and old headstock, smile repair which did not go all the way through and of course is completely invisible now. 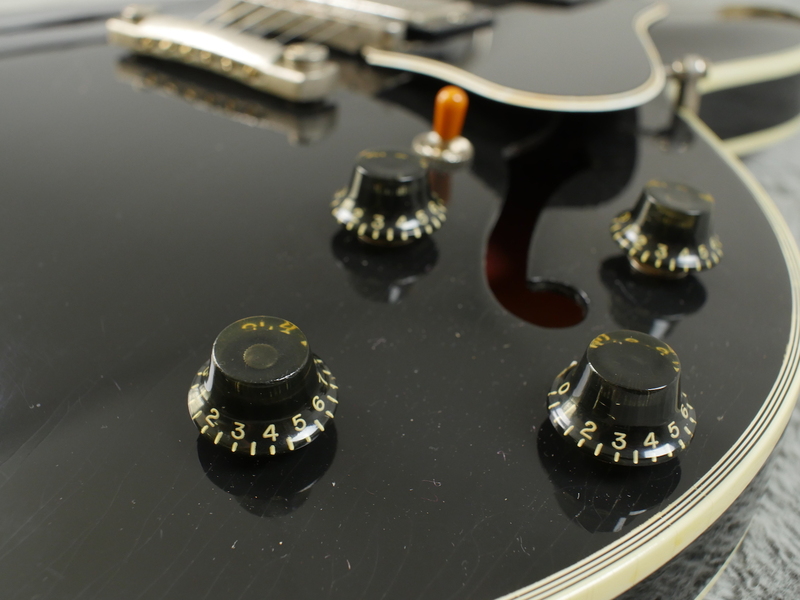 We have fitted it out with 2 x genuine PAF pickups and complete wiring harness from 1959 (pots dated 30th week of 1959) a 1959 no wire ABR-1, 1959 truss rd cover, knobs, pointers, switch tip, jack socket, pickguard bracket and some old Grover tuners. 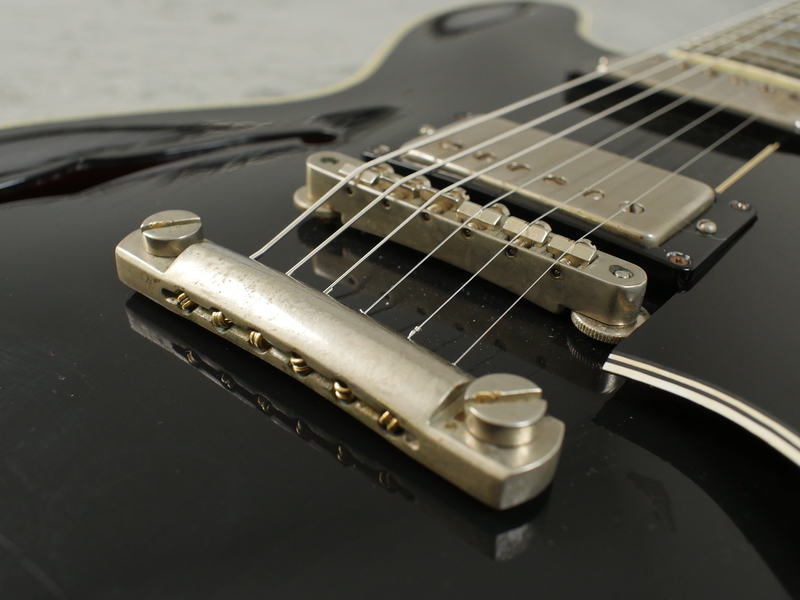 All the hardware is aged nickel and not artificially aged either, all have come from trusted sources, at great expense and make the guitar look, feel and sound a million bucks. 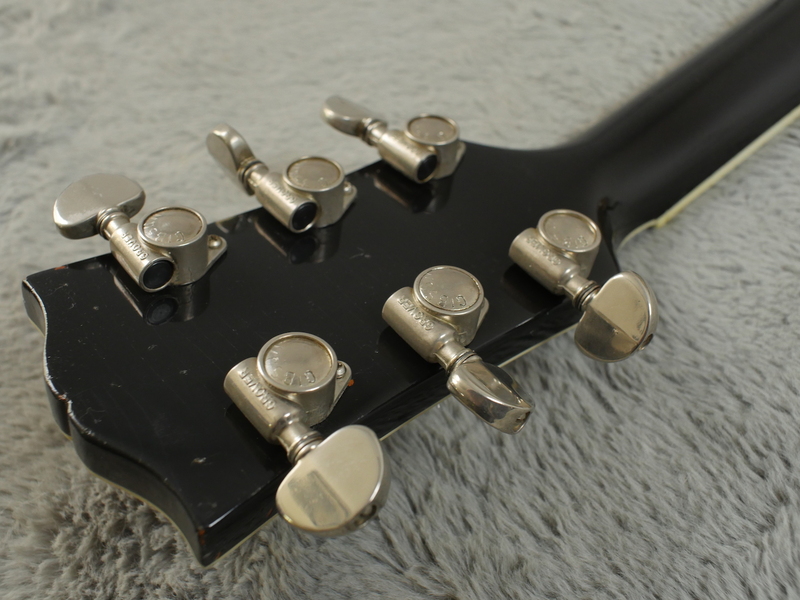 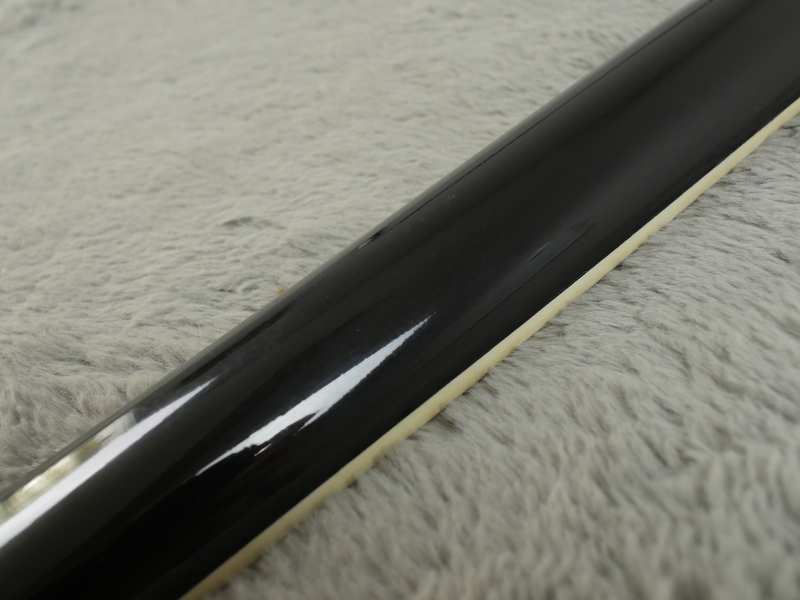 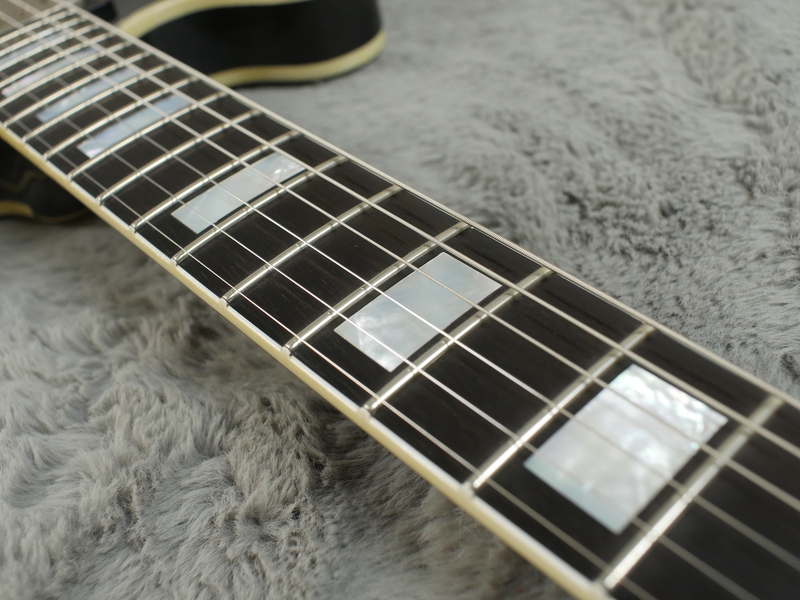 It has been recently refretted by HM I think, who have done one of the most incredible fret jobs I have seen which includes building up the nibs on the side of the neck to make it close to factory as possible. 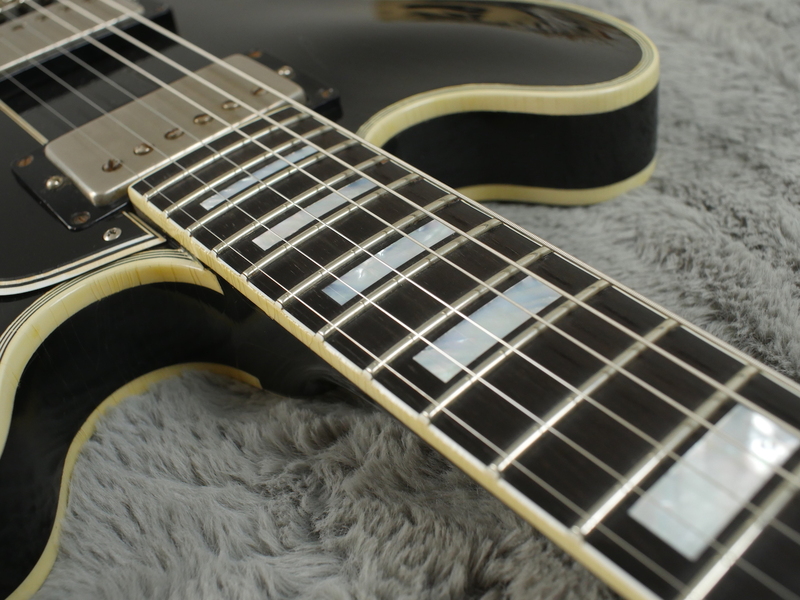 As a result of this, it plays brilliantly well, sounds as good as any ES you will pick up with its 2 x 1959 PAF’s with all original windings and at the moment is a firm showroom favourite with all the staff and visitors. 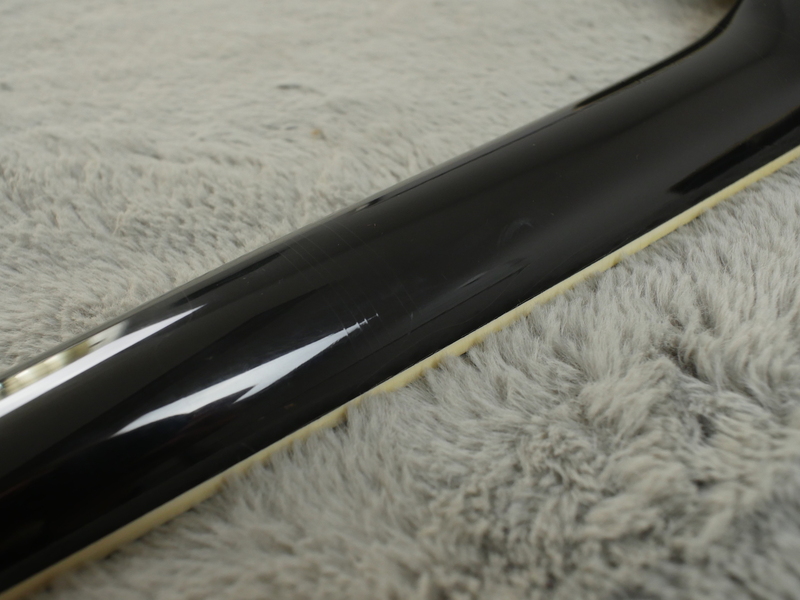 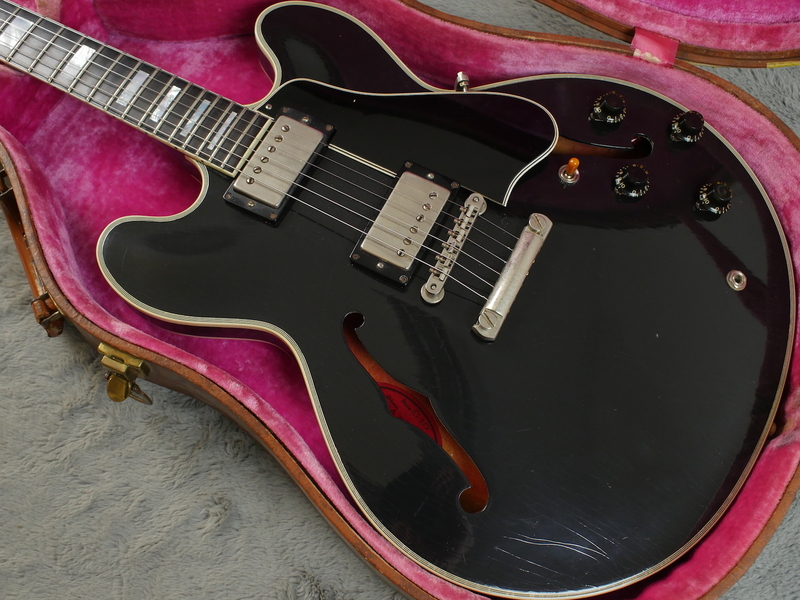 Unlike a lot of the original 355’s from that period, It has a classic 1959 fuller neck profile and it is a joy to play with incredible feel, presence and action all up and down its slick ebony fingerboard. 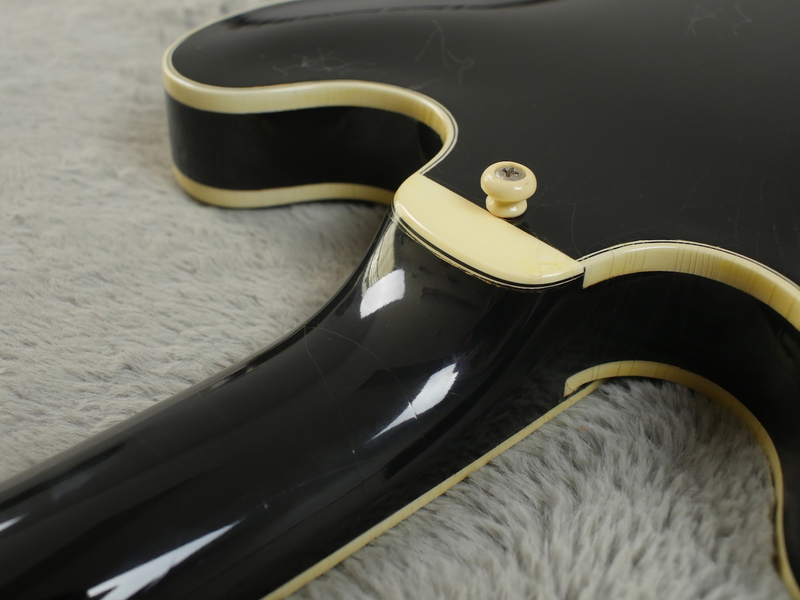 If you are looking at this as a player, which I really think you should, I cannot think of anyone who would be disappointed by this amazing guitar. 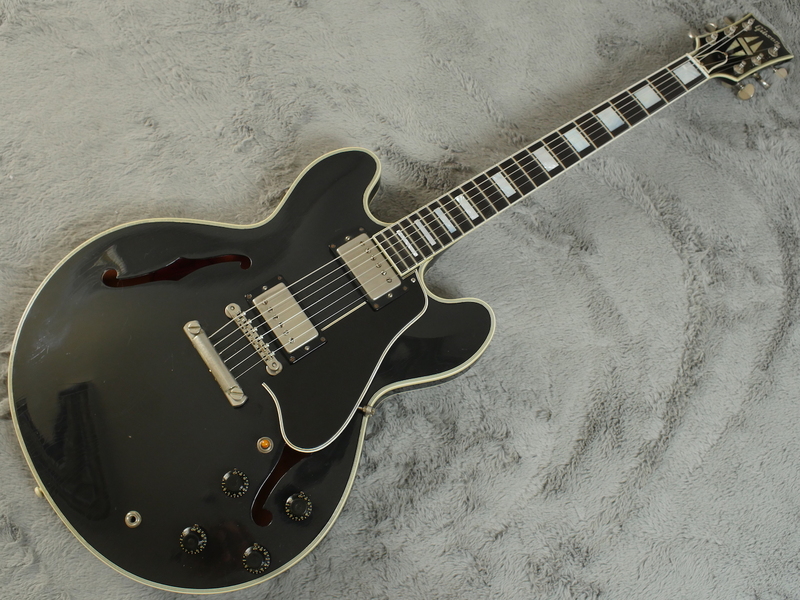 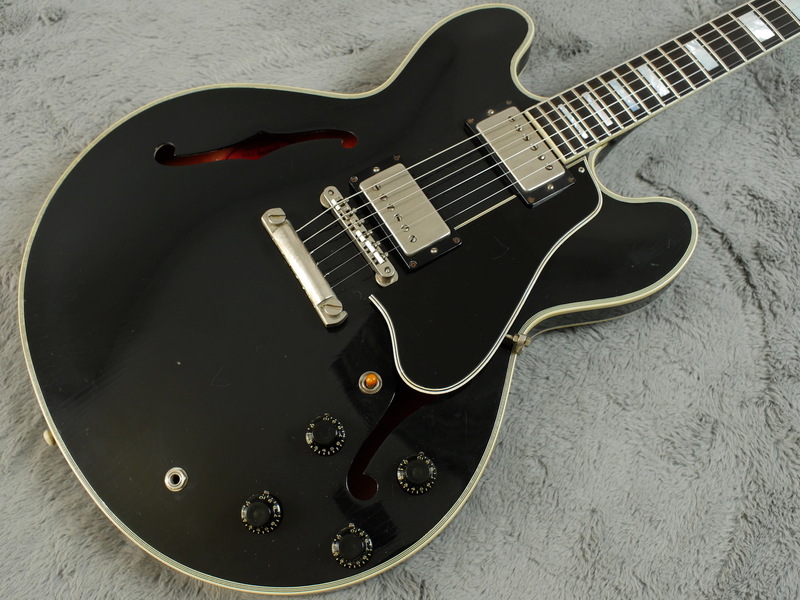 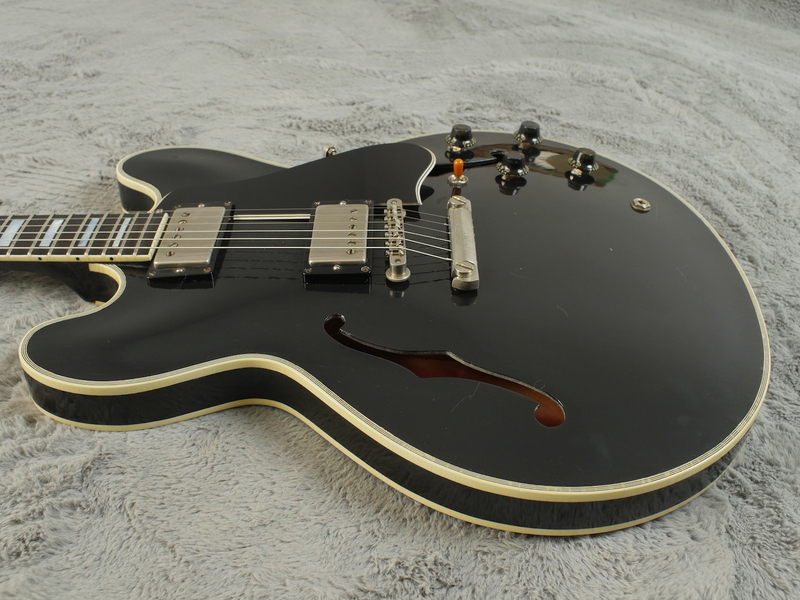 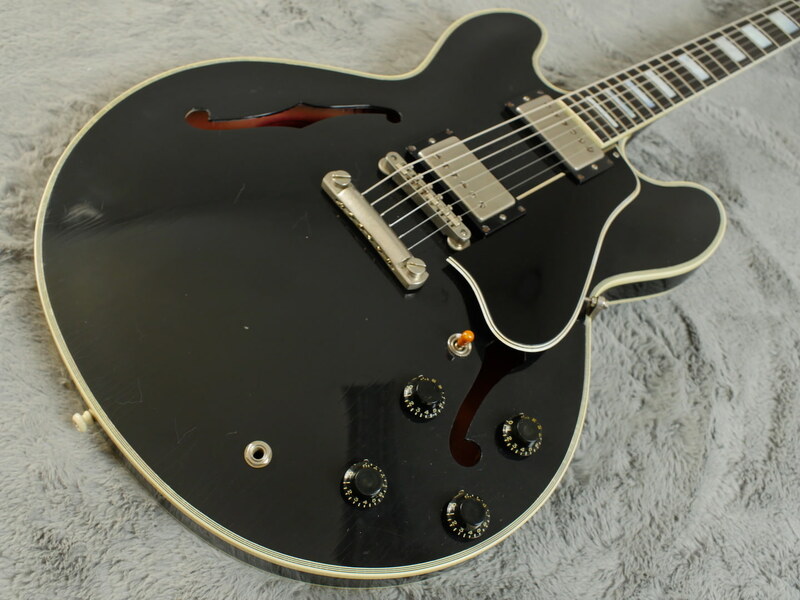 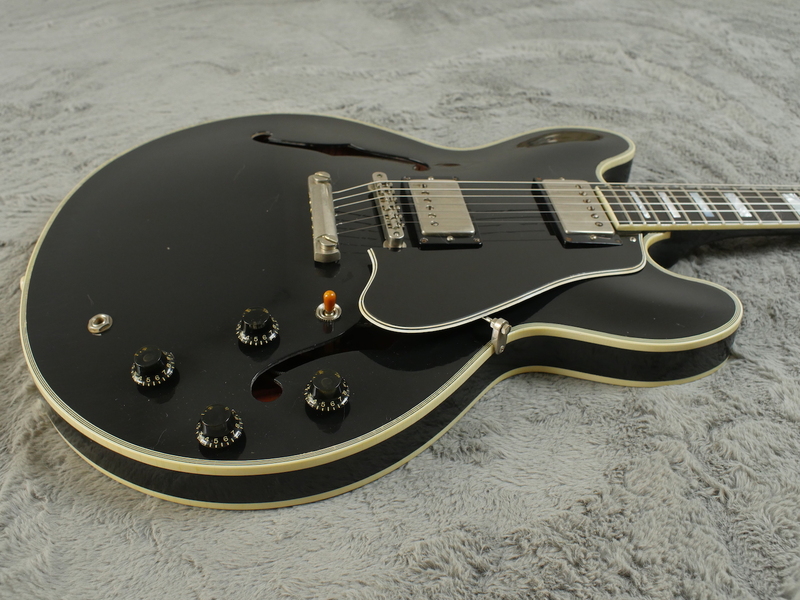 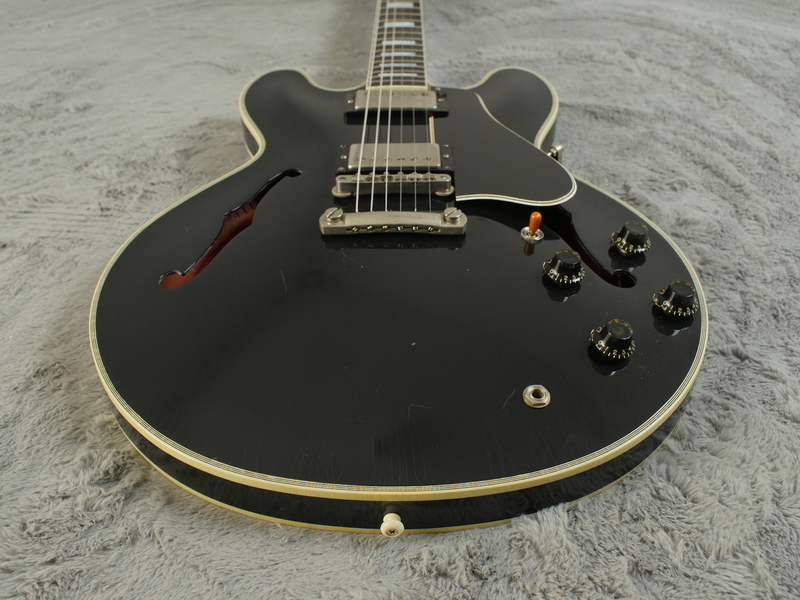 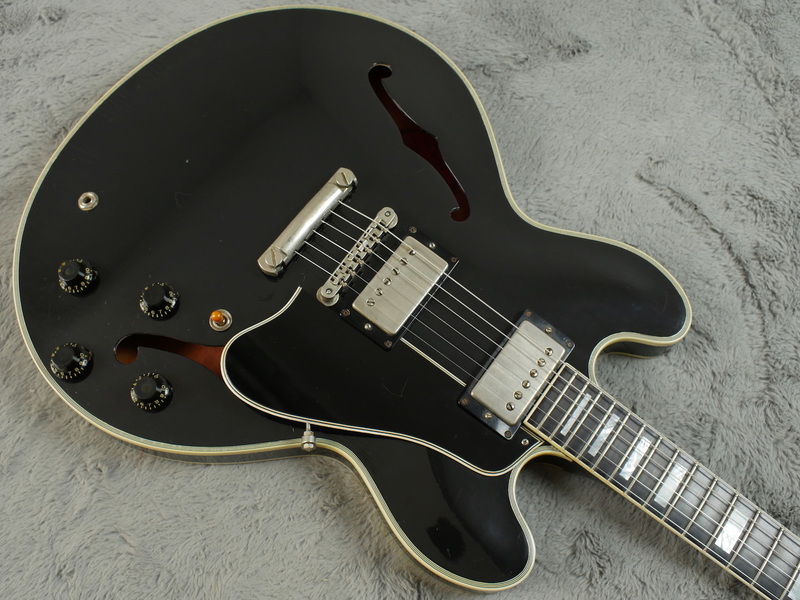 Last original mono stop tail ES-355 we heard of sold for not far short of 50k. 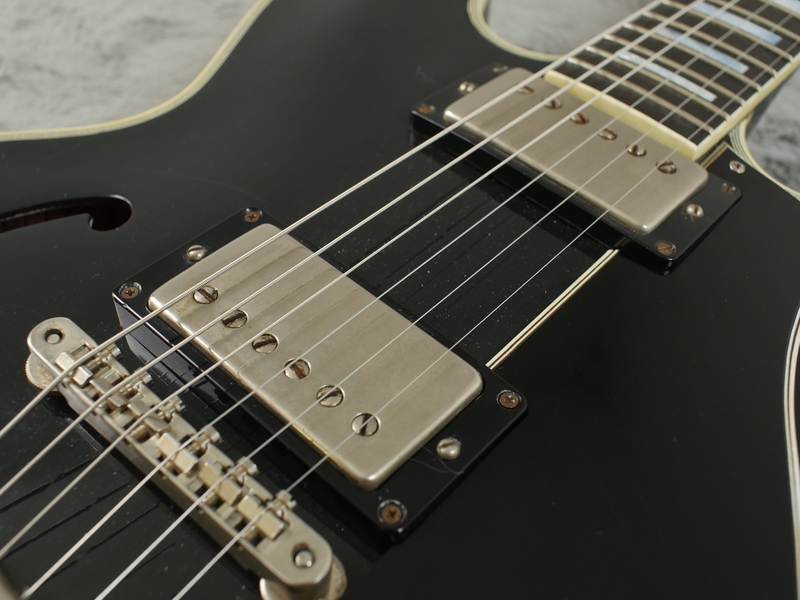 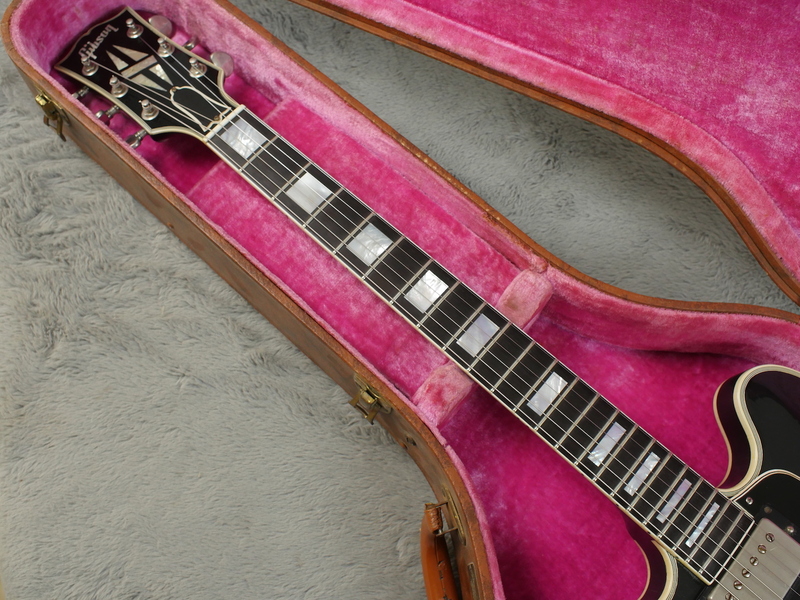 These are very rare and if you are an ES nut, a very desirable guitar. 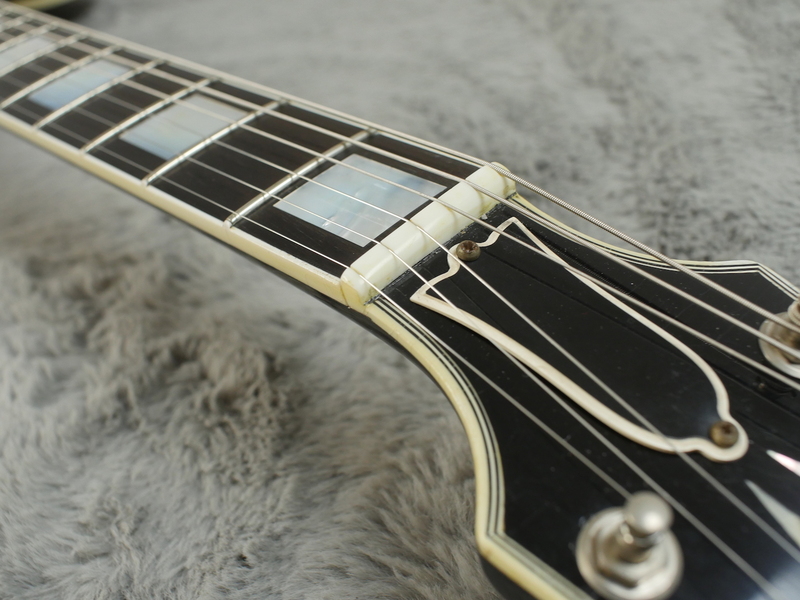 We have spent a lot of time and money restoring this and are proud of the way it shines in its new found glory. 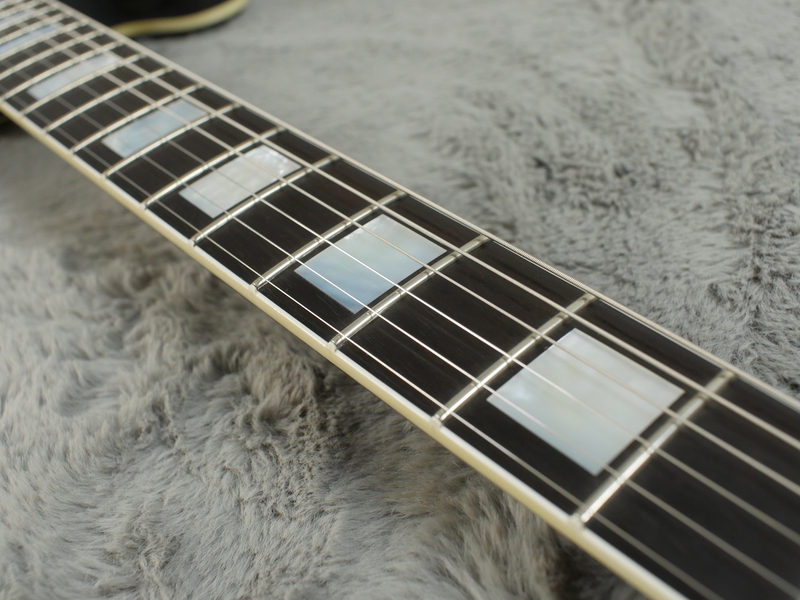 We will be exhibiting this at the forthcoming London Guitar Show so if you are around, pop over to our booth, say Hi and give it a try… I think it will be a long time before you find another like this!